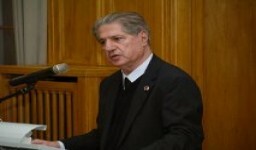 Amine Gemayel, the former President of Lebanon, warned on Thursday that the Arab world is experiencing a "crisis of religious pluralism" driven by "the rise of religious extremists," which threatens "any community which does not constitute the majority" – including Druze, Shiite Muslims, Alawites, Baha'is, and "Sunni Muslims living in Shiite-dominated areas." Speaking at a Christian Solidarity International (CSI) event in Zurich, Gemayel paid particular attention to the plight of Middle Eastern Christians, who he said are fleeing the region "in an exodus approaching biblical proportions." Gemayel cited "church burnings, physical assaults and killings" in Egypt, "an onslaught of murder" in Iraq and "a bloody-minded reign of terror" from "ultra-radical Islamists in regions of Syria where they have imposed their rule." Calling for an international response to the crisis, the former president declared that "preserving religious pluralism in theMiddle East is a vital imperative." Gemayel welcomed the U.S. State Department's recent condemnation of extremist persecution of Syrian Christians, but called for the U.S. to back up its "eloquent words" with action. Regarding Syria, Gemayel said "the most urgent priority" is to reach a "negotiated settlement" to the Syria conflict, and to "create a power-sharing agreement that preserves core state institutions while also dismantling the pervasive machinery of repression." At the regional level, Gemayel backed CSI's appeal for the creation of high-level interagency task forces in Washington and European capitals to prepare strategies aimed at securing religious freedom and diversity in the Middle East. Gemayel also called for an "Arab Marshall Plan" to aid the region's transition to democracy. Gemayel cited encouraging pro-pluralism initiatives by King Abdullah of Jordan, the Grand Imam of Al-Azhar Sheikh Ahmed al-Tayyeb, Saad Hariri of Lebanon, King Abdullah of Saudi Arabia and the Tunisian National Assembly as signs of hope for the Middle East. Gemayel rejected the "old, discredited model of social peace through political dictatorship," and declared that "despite the negative trends, the Arab Awakening remains one of the great hope-inspiring developments of early 21st century history." His proposed "Charter for Arab Democracy" can be found at www.aminegemayel.org/charter.